New ADR vacuüm unit – Van Hamburg Cleaning B.V.
We have expanded our fleet with a state of the art ADR (hazardous goods) vacuumtruck. 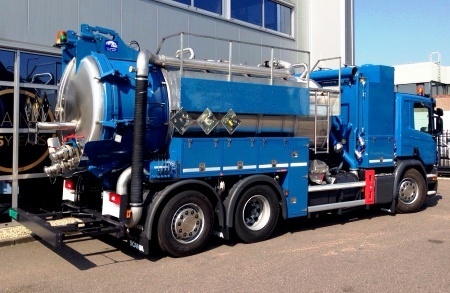 This modern truck is equipped with the latest on vacuum technology and safety regulations. In addition the truck comes with a high pressure jetting installation for special cleaning activities. Build on a Scania Euro 6 chassis it meets the latest emission standards.